Italian historian; born at Triest in 1808; died at Venice Sept. 9, 1861. Having at an early age lost his parents, who died in poor circumstances, Romanin found himself head of the family, with which in 1821 he removed to Venice, where he secured a position as tutor of French and German in a private family. His first literary attempt was a translation into Italian of the well-known historical works of Joseph von Hammer-Purgstall, under the titles "Impero Osmano" and "Dell' Origine, Potenza e Caduta degli Assassini"; the latter was published in 1828. This was soon followed by a rendering into prose of the German poem "Tunisiade" by Archbishop Ladislaus Pyrker (formerly Patriarch of Venice). From 1842 to 1844 Romanin's first great original work was published in three volumes under the title of "La Storia dei Popoli Europei dopo la Decadenza dell'Impero Romano." 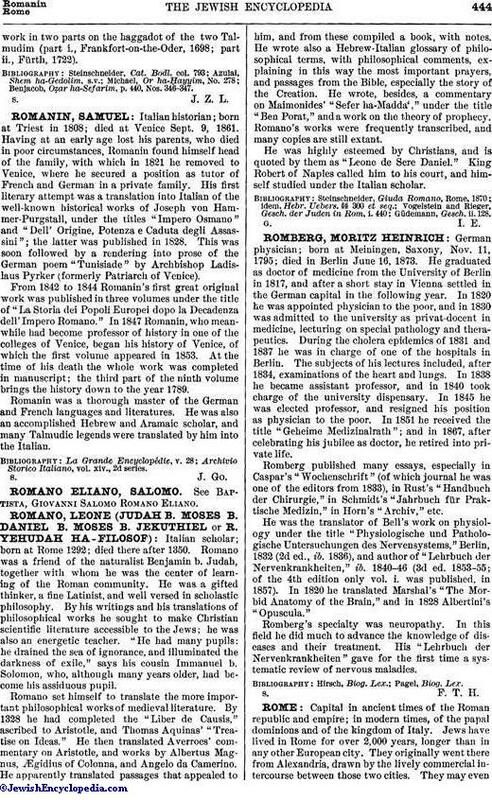 ln 1847 Romanin, who meanwhile had become professor of history in one of the colleges of Venice, began his history of Venice, of which the first volume appeared in 1853. At the time of his death the whole work was completed in manuscript; the third part of the ninth volume brings the history down to the year 1789. Romanin was a thorough master of the German and French languages and literatures. He was also an accomplished Hebrew and Aramaic scholar, and many Talmudic legends were translated by him into the Italian. Archivio Storico Italiano, vol. xiv., 2d series.